On a day when most commodities were trading lower after the U.S. proposed another round of new tariffs, December corn, November soybeans and September Chicago wheat all fell to new lows, one day before USDA’s next WASDE report. Midday: Trade falls to new lows again with trade scares and better weather. Corn trade is 5 to 6 cents lower at midday with fresh trade talk keeping pressure on the market along with a milder extended forecast. The U.S. looks to have a warm week to keep pushing the crop forward this week with more rain and seasonal temperatures the second week. Ethanol margins remain strong, with futures setting back slightly on a small production decline of 34,000 barrels, and stocks build of 418,000 barrels. Weak DDG prices are not having facilities as profitable as they could be. The weather is providing more feed out in pastures that has hurt demand some. Corn basis has been flat to firmer in recent days with the lower board. On the WASDE report tomorrow the average yield guess is 174.9 BPA vs. the current 174, with old crop ending stocks expected to be at 2.107 billion bushels, with the new crop average trade guess at 1.71 billion. On the September chart we remain below the 10-day at $3.53, with the 20-day at $3.60 the next round up. Support is the fresh low of $3.42 scored this morning with the lower Bollinger Band at $3.41 below that. 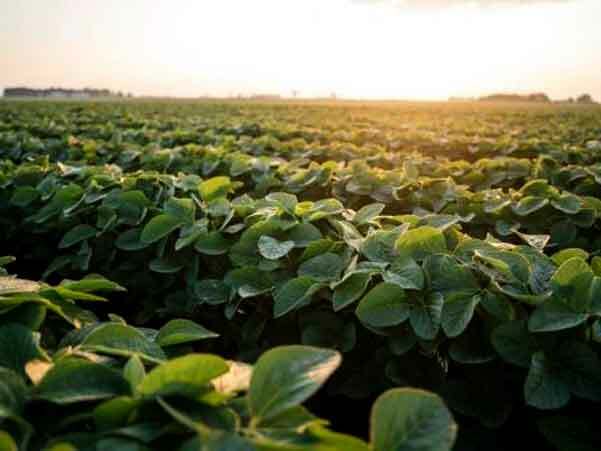 Soybean trade is down 14 to 18 cents at midday with trade reacting to another round of tariffs reconfirmed on China. Meal is flat to $1 lower and oil is 40 to 50 points lower. Brazil remains at a stout premium to US origin, which is compounded by the ongoing logistics issues with Brazil with premiums around $1.60 right now. Bean basis has remained steady to firmer with processors taking the lead. Trade will be watching for more sales on the daily wire with this advantage with nothing hitting the wire today. Weather should continue to push growth along in the near term. On the WASDE report, trade is looking for a yield of 48.6 BPA, with old-crop carryout at 507 million bushels, and new crop at 471 million. On the August chart, the 10-day at $8.58 is again the first level of resistance with further support the lower Bollinger Band at 8.22 with the next level resistance the 20-day at 8.86. Wheat trade is 10 to 16 cents lower overnight with spillover pressure from the row crops and a overall lack of fresh wheat specific news to push the wheat market higher with world harvest pressure. Harvest progress should continue to push along with the homestretch ongoing for the Plains. Spring wheat should see good progress with Canada with better rains starting to show up over the Prairie provinces. Russian harvest continues to move along as well. HRW basis has remains solid through harvest with the better protein. The WASDE report is expected to show wheat production at 1.858 billion bushels, and carryout at 973 million bushels. On the September chart, Kansas City is back below the major moving averages with the 10-day at 4.89 as resistance and support the $4.70 that has been support before.